Our 1931 bungalow is built in the craftsman style. While we certainly don’t embrace everything about this architecture style indoors, we do as much as we can to retain its character outside. It was really simple, actually. I just made a frame out of some leftover plywood and trimmed it out with some one-inch plywood strips on the sides. We painted everything in some complementary colors and coated it all with polyurethane afterwards to keep it weather-safe. 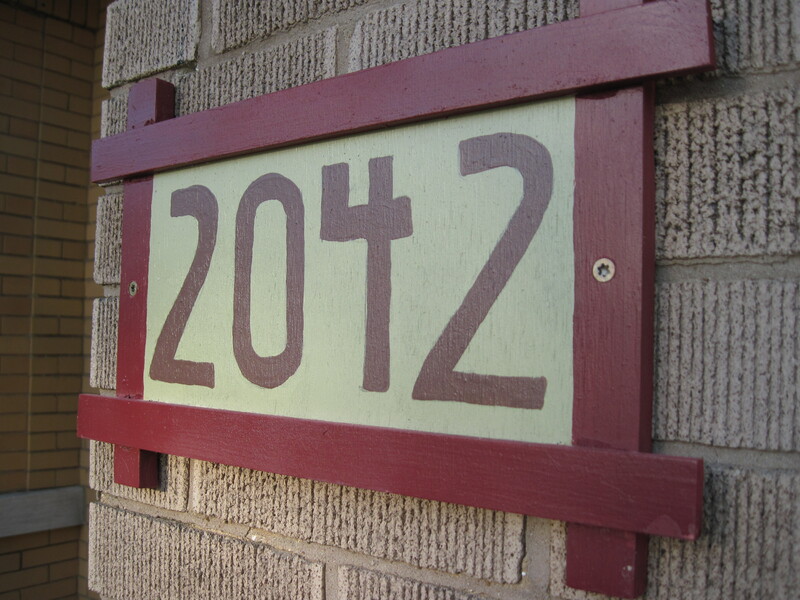 For the numbers, I simply found a font in the craftsman style, printed out our house numbers, and freehand drew them on then painted it in a contrasting color. We only had to pick up the trim and a couple of the paint colors. The rest of the supplies we had on hand. Nice work! I just realized we’re spending our 19th month living in someone else’s home with their furniture and pictures on the walls. 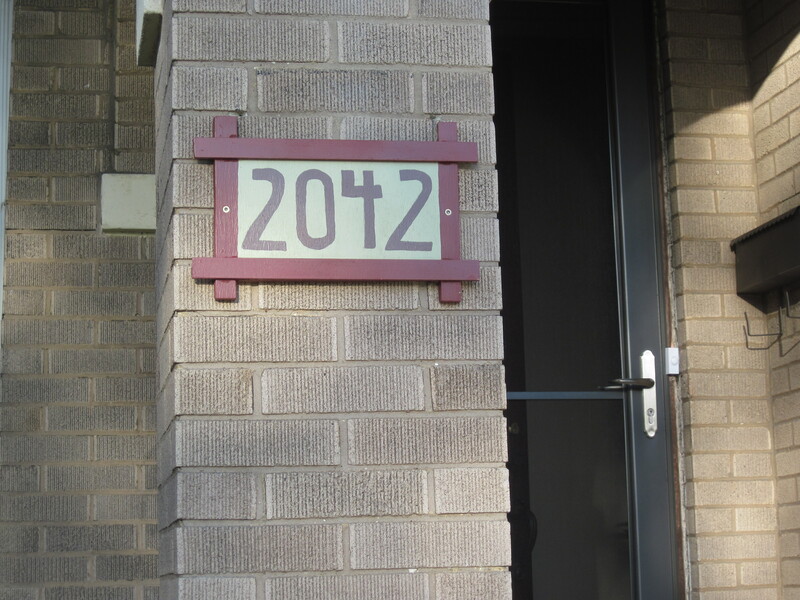 I used the picture of your house numbers on my site, because I loved it and I was doing a house number post. I gave you credit of course. You can check it out at http://www.fortheloveofpainting.com . I have a featured button if you would like! Thanks! I am going to put your site on my favorites! Augh! What a great site, and brilliant name. As I’m right in the throes of a couple of home-improvement projects myself, I’ll be checking back. Also, thanks for your comment on the Midwestyle today. Would love to know where your favorite thrifting haunts are…we’re looking for a few new places to try. Cheers! Cool. Would love to know what kind of home-improvement projects you’re up to. Also, your site is great – just added it to my Google Reader. I’ll let you in on my thrift store favorites, but I’m pretty protective of them. I’ll email you!